While the derogatory side effects of air pollution like asthma and respiratory tract infections have been recognized long ago; recent studies showed that air pollution can also trigger chronic conditions like appendicitis, breast cancer, high blood pressure and type II diabetes. A 2012 WHO report stated that growing air pollution is responsible for 7 million premature deaths due to varied reasons, worldwide. With growing industrialization as well as personal transport, the air in your environment is often loaded with numerous pollutants and dust particles. Although it is almost impossible to avoid this mess, one can take these few steps to reduce the exposure of air pollution. Avoid jogging or exercising in the area loaded with heavy traffic. Go off the streets in scorching heat. High temperatures reduce the air quality. Always stay informed about the air quality of the area you need to visit. You can use various apps and websites like ‘livemint’. Avoid and discourage the practice of smoking inside a room. 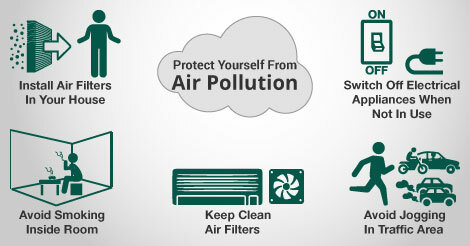 If you are living in an area with high air pollutant load, install air filters in your house. Make sure you install filters high on MERV scale. Always keep the air filters of your air conditioners and ventilators clean and dust free. Opt for recycled air mode on your a/c, while driving in highly air polluted area. Include food items like amla, cherries, and tomatoes in your routine diet. The anti-oxidants present in them traps the free radicals entered in your body due to air pollution and thus reduces the risk of health problems. Make efforts to reduce air pollution by avoiding extensive use of fireworks, and wood fire. Make sure to switch off electrical appliances when not in use, encourage the habit of carpool and use of public transport. The Delhi government’s odd-even scheme seems to be an effective experiment towards battling air pollution.